The Rotation group rotates the particles on any axis. You can give the particles a random rotation so they rotate in different directions, and orient the particles in very specific ways. 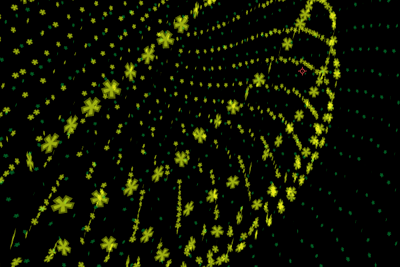 Rotate X, Y, Z: Rotates the particles around the X, Y and Z axes. These parameters are mostly for the Textured Polygon particle type. Rotation X: Sets the rotation around the X-axis. Only enabled for Textured Polygon. Rotation Y: Sets the rotation around the Y-axis. Only enabled for Textured Polygon. Rotation Z: Sets the rotation around the Z-axis. Enabled for Textured Polygon, Sprite and Star. Left to right, Rotate X at -50 and 100. Random Rotation: Adds randomness to the Rotation setting. Surprise! More specifically, this parameter rotates the particle around a random axis. Useful for getting a more natural looking effect where all particles have unique orientation in space. Rotation Speed X, Y, Z: You can set the particles' Rotation Speed separately on each axis. Rotation Speed X: Rotation speed on the X-axis. Only enabled for Textured Polygon. Rotation Speed Y: Rotation speed on the Y-axis. Only enabled for Textured Polygon. Rotation Speed Z: Rotation speed on the Z-axis. Enabled for Textured Polygon, Sprite and Star. 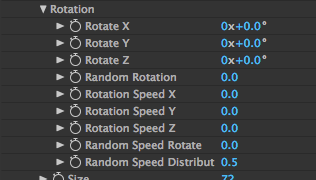 Random Speed Rotate: Makes the particles rotate at random speeds. 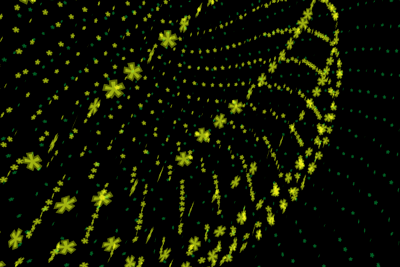 Some particles will rotate fast, some slower, which is very useful in giving a natural appearance for the animation. Random Speed Distribution: Enables fine-tuning of the randomized speed of Rotation Speed. The default value of 0.5 is the normal Gaussian distribution. Setting the value to 1 will give a flat, even distribution.